MacDonald Carey and Alexis Smith star in the heavily plotted western Cave of Outlaws. Carey plays Pete Carver, who has spent 10 years in jail for participating in a train holdup. Upon his release, Pete heads to the huge cave where his cohorts had hidden their loot. Not surprisingly, he is trailed to the hiding place by several interested parties, including Wells Fargo investigator Dobbs (Edgar Buchanan) and all-around baddie Ben Cross (Victor Jory). Smith plays the vengeful widow of a newspaperman who was murdered by the crooks, while Hugh O'Brian is suitably menacing as Cross' trigger-happy nephew. 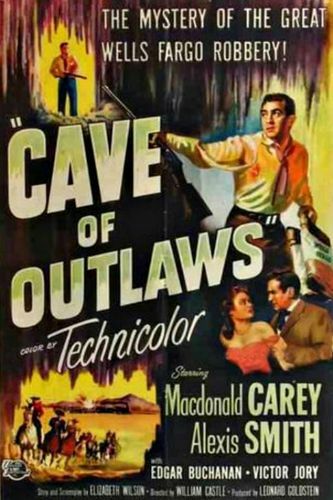 Cave of Outlaws was Technicolorfully filmed on location in Carlsbad Caverns.